Almost any habitat that includes a nearby lake, pond, stream, or pool in which to breed. This is a very large salamander, one of the largest salamanders in North America. It is common within its range but in Minnesota that range barely extends into the westernmost counties. It has a broad head, a stout body, and a long tail. The skin is smooth and somewhat slippery. The color pattern varies significantly across the geographic range of the species, from a grayish-black background with brownish-yellow irregular blotches, to a brownish-yellow background with grayish-black irregular blotches. There are 11 to 14 vertical grooves on the side of the body. There are four toes on each front foot. Aquatic invertebrates, plankton, and other salamander larvae. Earthworms, insects, and other invertebrates; occasionally small reptiles and amphibians; other salamanders. Breeding takes place in the early spring, often before the ice has cleared from the surface of the pond. To initiate breeding, the male will nudge a female then deposit a sperm capsule on the pond bottom. The female picks up the sperm capsule. After fertilization the female lays up to 1,000 eggs, depositing them singly or in very small clusters on submerged vegetation. The eggs hatch in 2 to 5 weeks. The larvae are usually about 5″ long. They have large external gills and a prominent tail fin (caudal fin) that extends from just behind the head on the upper side to the belly on the underside, wrapping around the tail. Larvae may metamorphose into sexually mature adults in their first or second summer, or they may become sexually mature without metamorphosis. The sexually mature, non-metamorphosed adult is known as a waterdog. Adults overwinter in burrows or under logs or other debris. Their lifespan is 10 to 25 years. This salamander, like all salamanders, is rarely encountered. It spends the day in an rodent burrow, coming out at night to feed. It is sometimes seen in the spring or fall during or just after a heavy rain crossing a road between an upland site and a pond. 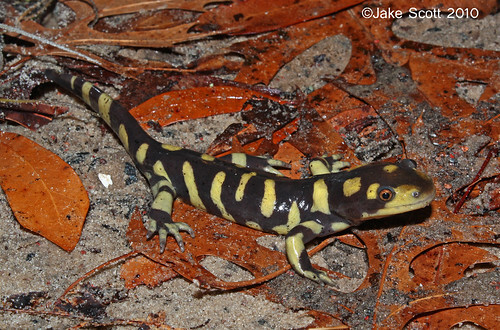 Until recently, this salamander was considered a subspecies of eastern tiger salamander (Ambystoma tigrinum). Based on genetic analysis, that species was broken up and three of the subspecies were elevated to species rank, including Ambystoma mavortium. Most print resources and many online resources still classify this salamander Ambystoma tigrinum melanostictum. 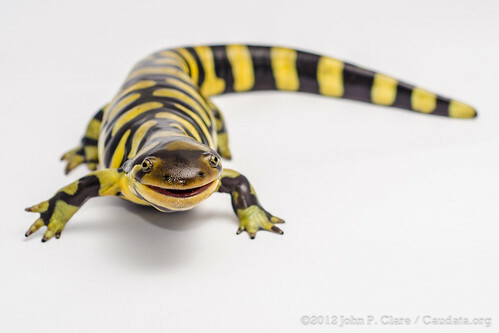 This very large Blotched Tiger Salamander (Ambystoma tigrinum melanostictum) measures 23 cm or 9 inches in length. This salamander was captured, photographed, and released (with a smaller companion specimen, measuring 18 cm or 7 inches), this Saturday morning, 07 September 2013, at the Turtle River State Park, North Dakota.